After having read part 1, Install Cubicle Hardware and deciding upon the configuration of your cubicle, you can start looking into the hardware you will need to assemble your cubicles. Once you have chosen your board you will then need to source suitable cubicle brackets in which to assemble your cubicles. Brackets are most commonly supplied for 13mm and 20mm partitions in either L-shaped or U-shaped format. L-shaped brackets are typically recommended for fitting in end cubicles as they connect your board directly with the corner fixing surface, whereas U-shaped brackets are best suited to centre cubicles as they enable secure fitting on either side of the board. Once you have established which brackets to use, you then need to determine the quantity required. Brackets should be fitted to the board at both the top and bottom of your cubicle, connecting your board to the rear wall and front pilaster on both sides, a further bracket can be fitted centrally on either side to reinforce the stability of the structure overall. Headrail is an essential component when installing cubicles, it finishes the cubicle and provides the additional support for the partition. Cubicle headrail is commonly available in three and four metre lengths and offered in four main styles, all of which are screw fixed into position. Perhaps most commonly used is Channel headrail. This is a u-shaped headrail that simply slides over the top of 13mm board and is top-fixed into position, leaving a tidy finish across the top of the cubicle. For 20mm board however, Angle headrail is most commonly used. As the name suggests the underside of this headrail is fashioned into a right angle or ‘L’ section, which rests on top of your partition before being fixed into position with wood screws. D-shaped headrail is a versatile alternative to the aforementioned headrail types, as it can be fitted in conjunction with either 13mm or 20mm board. It is similar to that of Angle as features an ‘L’ section flange on the underside of the headrail which is fixed to your partition with wood screws, but it also features a stylish dome-shaped exterior for an aesthetically pleasing finish. 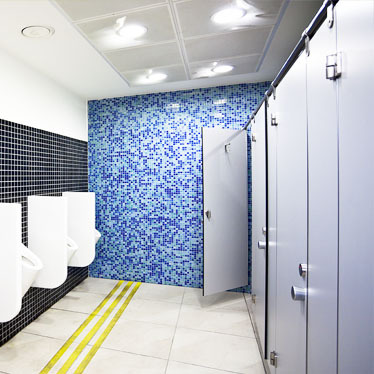 For those installing a floating partition, for example to create a barrier between the bathroom door and urinals then box section can be used. This is fitted vertically by seating the box section headrail into a secure base therefore allowing the partition to be mounted against it. Read part 3 'Cubicle Hinges and Leg Supports' of our 4-part blog for information on choosing the best hinges and leg supports for your cubicles!